Entrance #4: Juvenile Detention Center (turn right), Treatment for Adolescents in Secure Care (TASC) (turn left) and Outpatient Counseling Clinic (turn left), Juvenile Court (turn left.) 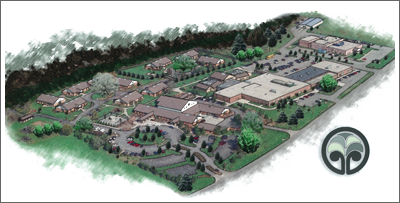 *Also located on the YOC campus are the Department of Child Services (turn left) and the Delaware County Juvenile Probation (turn right) and Court Appointed Special Advocates (CASA) (turn left). From I-69 North: Take the Daleville Exit to 32 east, follow SR 32 through Daleville and Yorktown. YOC is on the north side of SR32, approximately 4-5 miles from Yorktown. Or: I-69 to exit 41 or the 332 exit. Continue to follow 332 (McGalliard Road) to Tillotson Avenue, turn right on Tillotson and follow until it intersects with SR 32 (Kilgore Avenue), turn right. YOC will be on the right about a half-mile down the road. From I-69 South: Take the Daleville Exit to 32 east, follow SR 32 through Daleville and Yorktown. YOC is on the north side of SR32 approximately 4-5 miles from Yorktown. From SR 3 North: At the edge of Muncie, SR3 intersects with SR67 (Broadway). Go on McGalliard Road, turn right, go on Tillotson Avenue, turn left, follow Tillotson to SR32 (Kilgore Avenue), and turn right. YOC will be on the right about a half-mile down the road. From SR 3 South: Take SR 3 to SR 35 South at the edge of Muncie, turn right to go to the Muncie by-pass. Take by-pass west to Cowan Rd. Turn right (north) on Cowan Rd. Go to 26th St. Turn left (west) and go to Martin Luther-King Jr. Blvd. Turn right (north) and go to Cornbread, turn left (west) and go to Perdieu St. (north) and go to Kilgore (stop light). Turn right and the YOC will be on the left before the underpass. From I-70 East: SR 35 exit at Richmond to the Muncie by-pass (sign will say SR35, 67, and 3 North), take the SR32 exit, to the West edge of Muncie. Or, SR 38 exit at Richmond to SR 3. Take SR3 to SR 35 at the edge of Muncie. Turn right to go to the Muncie by-pass (sign will say SR 35, 67, and 3 North). Take the by-pass to the 32 exit. Follow SR 32 to the west edge of Muncie (last stop light before you reach YOC is Tillotson Avenue). YOC will be on the right about a half-mile down the road. Or, Take I-70 to SR3 North to SR35 South, turn right to the Muncie by-pass (sign will say SR35, 67, and 3 North). Follow the by-pass to the SR 32 exit. Follow SR 32 to the west edge of Muncie (last stop light before YOC is Tillotson Avenue). From Evansville: I-64 to I-65 to 465 East to I-69. Take the Daleville Exit to 32 east; follow SR 32 through Daleville and Yorktown. YOC is on the north side of SR32 approximately 4-5 miles from Yorktown. Or: I-69 to exit 41 or the 332 exit. Continue to follow 332 (McGalliard Road) to Tillotson Avenue, turn right Tillotson and follow until it intersects with SR 32 (Kilgore Avenue), turn right. YOC will be on the right about a half-mile down the road. From I-65 North: I-65 North to SR 28, turn east. Take SR28 to I-69 South. Take the Daleville Exit to 32 east; follow SR 32 through Daleville and Yorktown. YOC is on the north side of SR32 approximately 4-5 miles from Yorktown. Or: I-69 to exit 41 or the 332 exit. Continue to follow 332 (McGalliard Road) to Tillotson Avenue, turn right Tillotson and follow until it intersects with SR 32 (Kilgore Avenue), turn right. YOC will be on the right about a half-mile down the road. From I-65 South: I-65 South to 465 East to I-69 North. Take the Daleville Exit to 32 east; follow SR 32 through Daleville and Yorktown. YOC is on the north side of SR32 approximately 4-5 miles from Yorktown. Or: I-69 to exit 41 or the 332 exit. Continue to follow 332 (McGalliard Road) to Tillotson Avenue, turn right Tillotson and follow until it intersects with SR 32 (Kilgore Avenue), turn right. YOC will be on the right about a half-mile down the road.